Merit selection and retention is a system of selecting Justices established by the voters when they amended the Florida Constitution in the 1970s. Under this process, the Governor appoints new Justices from a list of three to six names submitted by a Judicial Nominating Commission. The Governor must select from the list. Once appointed, Justices eventually must face the voters in a "yes" or "no" vote as to whether they should remain in office. New Justices face their first merit retention vote in the next general election that occurs more than one year after their appointment. If not retained in office, the Justice will be replaced in the same manner appointed. Justices' merit retention races are conducted on a statewide basis. If retained, each Justice serves a six-year term beginning in early January following the first merit retention election. The Justice then will again face an up or down vote in the general election occurring just before the six-year term expires. If not retained in office, the Justice will be replaced through the Judicial Nominating Commission system. All terms of Justices end in early January of the year following their merit retention elections. The exact date is the first Tuesday that follows the first Monday in January of that year. The Florida Bar publishes "The Vote's in Your Court" as a resource for votes regarding judges and judicial elections. Q: What are the Justices' party affiliations, if any? A: A Florida statute passed by the legislature, Section 105.701, makes it illegal for any person to use a party affiliation in connection with a judicial election. The penalty is up to $1,000 per violation. All judicial races are required to be nonpartisan under this law. In a merit retention election, court staff thus cannot tell you party affiliations, if any, of the Justices facing a vote. You can obtain that information through the appropriate county supervisor of elections' office. Q: How have the Justices voted in cases? A: A complete record of their votes in cases can be found on the Opinions Page of this website. Q: Can I watch videos of the Justices at work? A: Yes. All of the Court's arguments are webcast live and also are archived at its Gavel to Gavel website and on our Facebook Live page. Q: What are the Justices' stands on particular issues such as abortion and the death penalty? A: Canon 7 of the Code of Judicial Conduct forbids the Justices from saying how they will decide future cases because they must remain truly impartial. However, their votes in prior cases are available on the Opinions Page. Q: How can I learn more about the Justices backgrounds? A: Biographies of the Justices are available on this website. Q: How did Florida decide to use the merit retention election system? A: In the mid-1970s, Florida's voters overwhelmingly approved a constitutional amendment requiring that the merit retention system be used for all appellate judges. This vote came after the public became concerned about abuses that occurred because of the earlier system of contested elections that led to a court scandal in the 1970s. Q: Where can I find results from prior merit retention elections? A: The Florida Division of Elections maintains a searchable Database of prior election results from prior elections. Note that merit retention elections only occur during the General Elections in even-numbered years if any Justices are nearing the end of their terms. 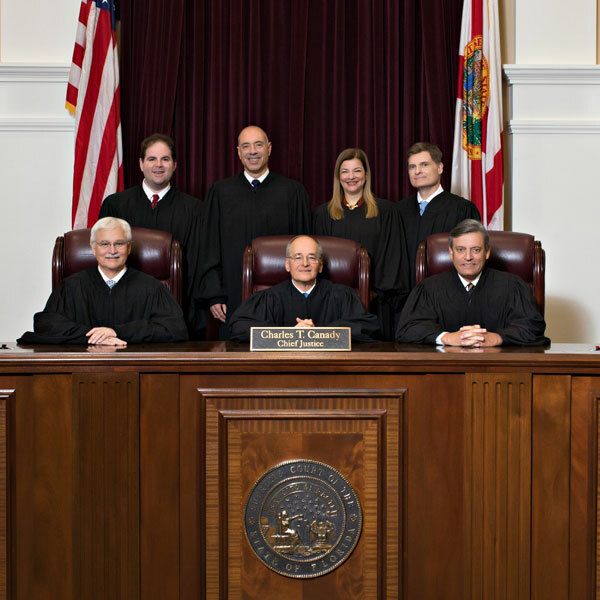 The Florida Constitution was amended in 2018 to establish a mandatory retirement age for Justices that occurs on their 75th birthdays. They are required to retire on the date of this birthday. Before this amendment took effect on July 1, 2019, Justices were required to retire on their 70th birthdays, although there was an exception if that birthday fell in the second half of their six-year term. In that event, the Justices were allowed to complete the full six-year term. This exception was abolished in the 2018 amendment and no longer applies.